Ukiyo-e is a Japanese style of woodblock art print that was widely produced during the 17th and 20th century. It is one such art style that distinctly sets the Japanese apart from other Asian art. Now, imagine the ukiyo-e in a whole new way: it features widely famous video games that we all know, love, hate and mash buttons to. Enter Jed Henry. 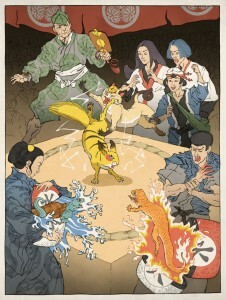 This talented artist uses ukiyo-e in making his own fan art of well known videogames. On June 26, he has finished his take on Pokemon (shown left). Try to guess the characters in the print! 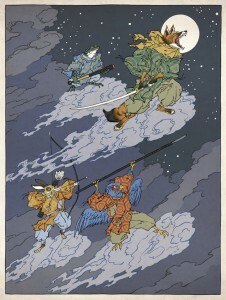 Ukiyo-e Heroes mostly covered Nintendo video games, including Star Fox, Kirby, Metroid, Mario Kart and the Legend of Zelda. Jed Henry, however, does not limit his art to a single video game company. On Tumblr, a fan asked the question whether he (Jed Henry) would consider making SEGA woodcuts, to which the artist answered “Oh yeah. Because SEGA is also Japanese, it’s a perfect match for my project.” Henry also has prints on Konami’s Castlevania (shown right) and Capcom’s Street Fighter and Megaman. Ukiyo-e Heroes is not just art drawn on paper, they really are woodblock prints. Jed Henry enlisted the help of Tokyo-based woodblock printer David Bull to give his art authentically ukiyo-e. Check out the video below on how David Bull carves the color block of the Mario Kart woodblock print. Good news to all fans of the Ukiyo-e Heroes! Jed Henry will be putting up his art for sale starting on August 1. 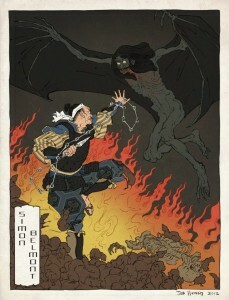 Check out his Facebook Fan Page and Tumblr account for news, updates and the latest Ukiyo-e art!